I love to crochet. One of my favorite things about it is getting to share it with others. I’ve always loved stitching up gifts for other people. And while I’ve made all sorts of things, my go-to’s are always crochet scarf patterns. A scarf can be unisex and is always practical, so it’s perfect for anyone. It’s also got that element of thoughtfulness that a gift needs. 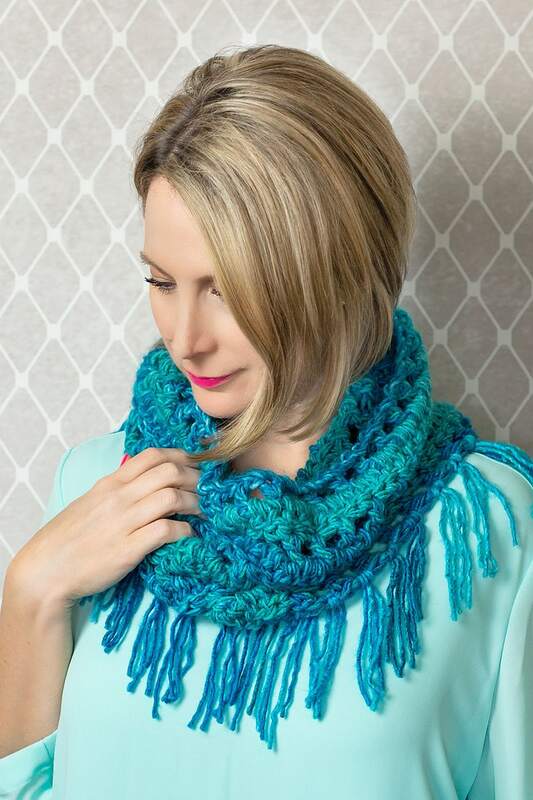 With so many simple patterns out there, it’s easy to learn how to crochet a scarf. And if you’re new to crochet, scarf patterns are the best patterns for beginners. The majority of scarf patterns are easy to follow and have very simple shapes for the most time. If you’re looking to make a gift for someone special or just want some easy patterns to work up, check out this great list. 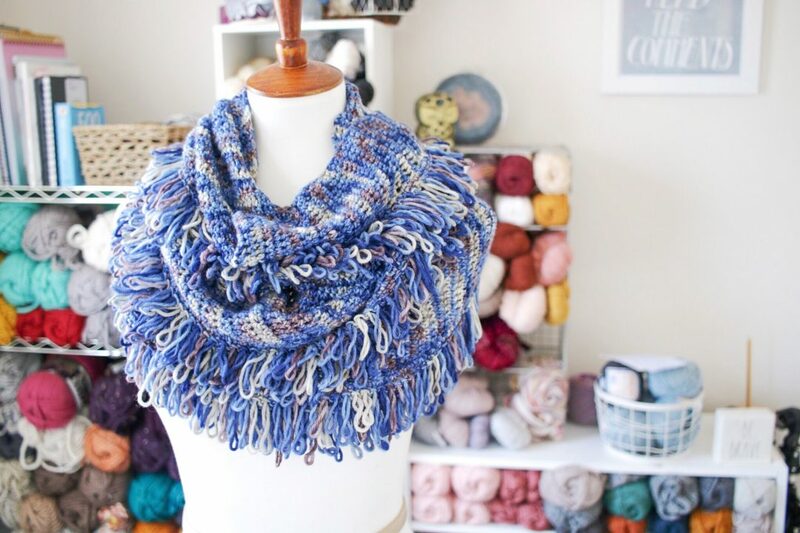 It’s full of free scarf patterns like crochet cowls or infinity scarves. 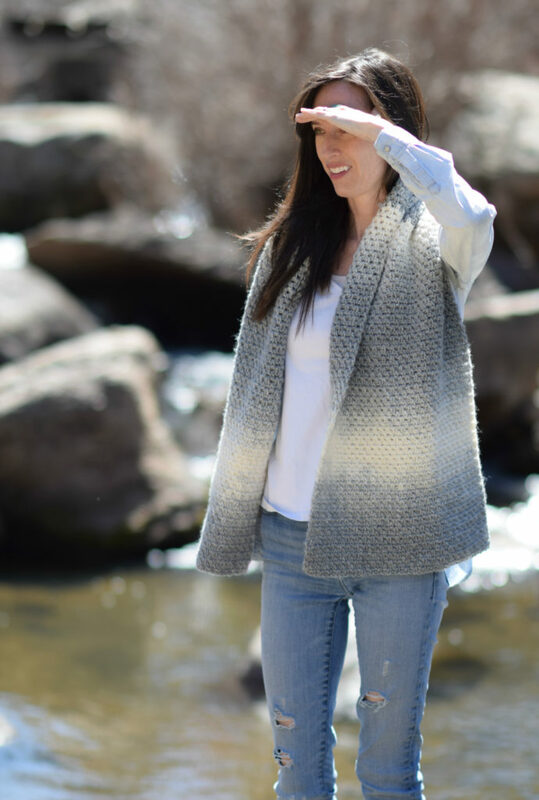 These easy patterns are perfect for winter, and there’s a style for everyone. They take no time to make, so you don’t have to worry if you’re in a rush. Scroll through this list of beginner crochet patterns. You can choose an infinity scarf pattern for your trendy niece. Or a hooded scarf pattern for someone who spends a lot of time in the cold. These simple patterns are full of winter scarves with unique crochet stitches. With so many options out there, we’ve provided you with the best patterns for an easy scarf. See for yourself. The Cara Scarf uses one of our favorite stitches, the Loop Stitch. 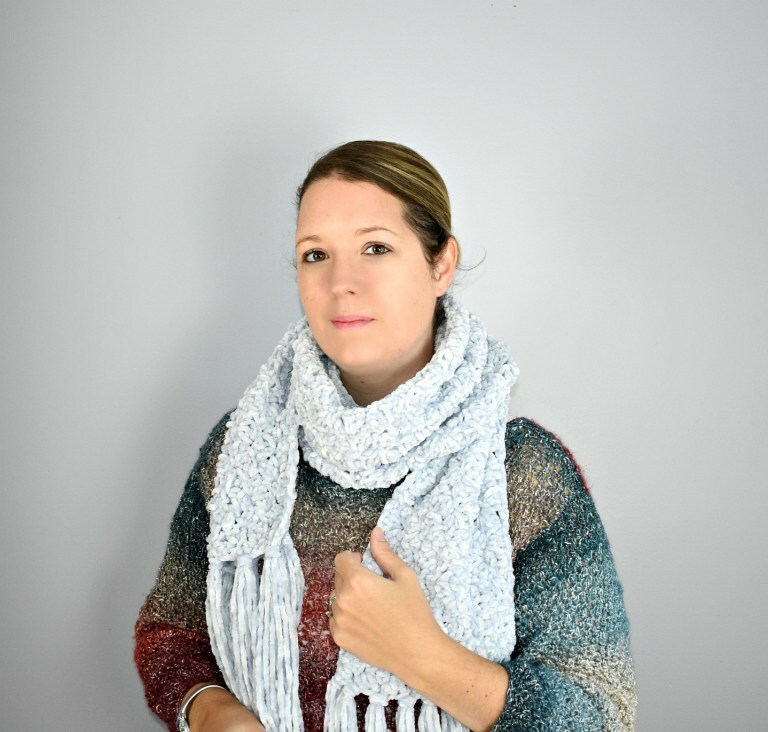 This wrap scarf is a great way to practice this unique crochet stitch if you’ve never tried it. It’s made from end to end with single crochet stitches and an added fringe border. The ribbed-knit look on this free infinity scarf pattern is extremely easy, thanks to a slight variation on basic crochet stitches. This pattern is made using only basic half double crochet stitches. Because of how these stitches are worked, they create the look of knit ribbing stitches. With the regular back and forth motion of a typewriter carriage, this surprisingly easy technique of tunisian crochet works up quickly and densely, perfect for warm and cozy scarves. The Gobelin Tunisian Stitch creates a nubbly reverse side is just as appealing as the smooth front and the drape is dramatic and the feel, wonderfully soft. 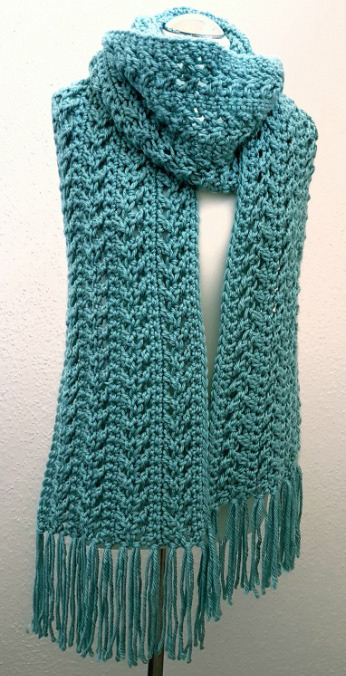 If you have the single and double crochet stitch mastered, then you will be able to recreate this scarf. 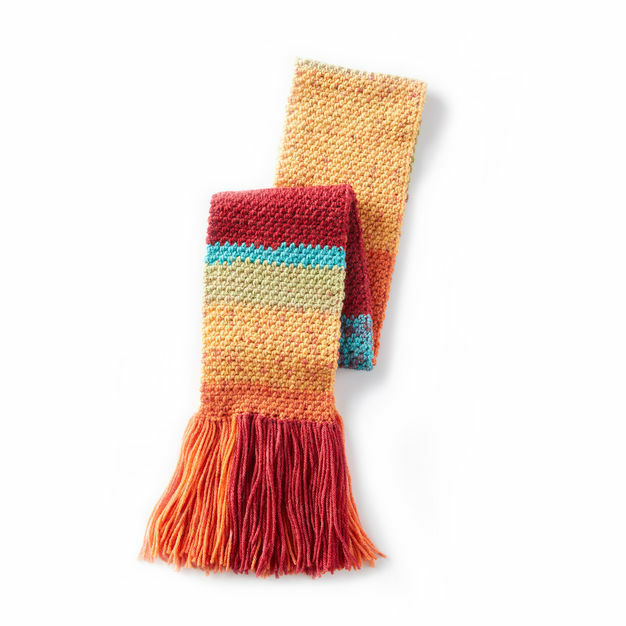 Made with chunky yarn, this fringe cowl can be made up in a matter a matter of hours. Make them in different colors and give them to all your friends. It’s the perfect project for beginner crocheters! It’s so easy to make and uses only basic crochet stitches so you can make it while you watch Netflix. Then make 10 more simple scarves and give them to friends, they’ll love it! Oversized chunky scarves are such a popular trend right now, as they always add such a luxurious touch to any outfit, especially when they’re in sophisticated neutrals, resulting in timeless pieces to be added to your wardrobe. Doesn’t that texture look like the most perfect thing to snuggle in this Winter? This scarf uses the perfect stitch – the “Crunch Stitch”. This simple crochet stitch has one of the loveliest textures that closely resembles the purl stitch in knitting. 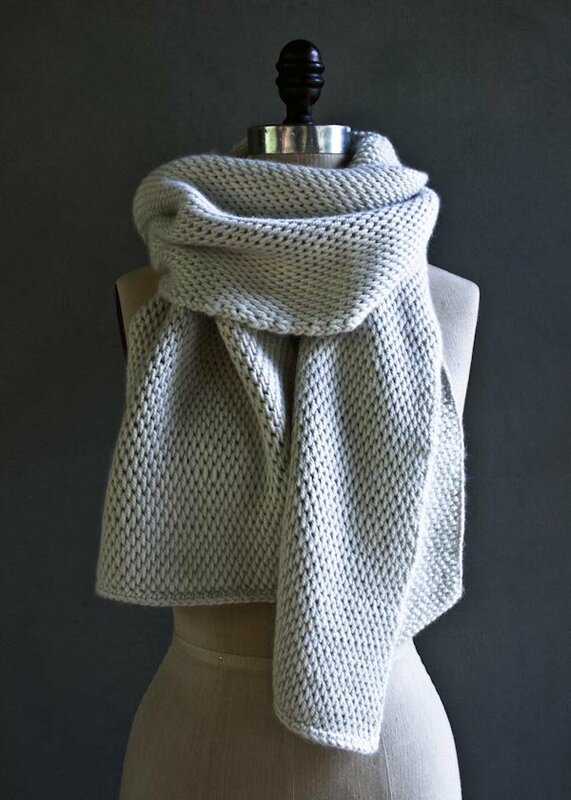 We love texture and this scarf is all about the texture. This easy pattern makes the perfect day-to-day scarf that we’re sure will become your go-to whenever you need to have a little coziness around your neck. 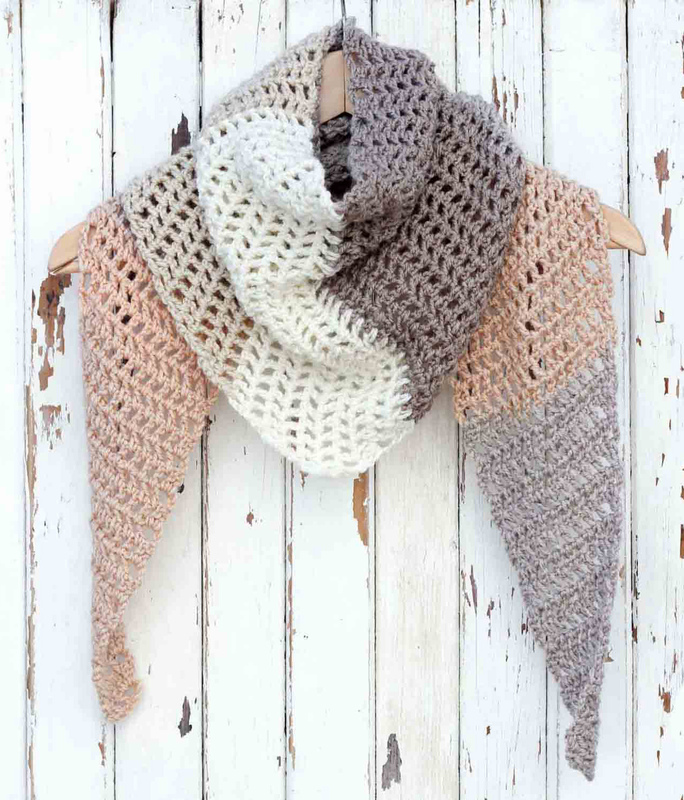 Make your own stylish, chunky, tasseled super scarf with this free pattern. 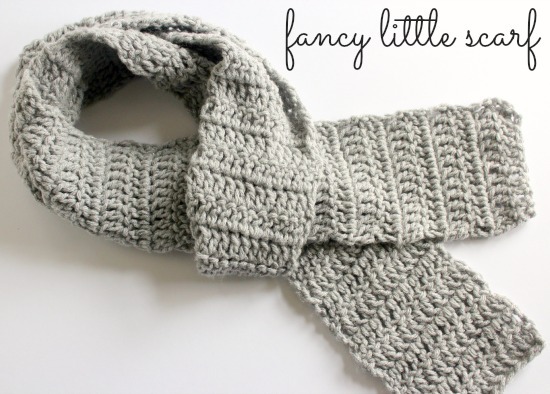 Learn how to crochet a scarf that’s easy and cute too! We’ve been loving the big blanket scarf trend, and wanted to make a gorgeous crocheted version. It is a lot of fun to wear and will definitely keep you (or whoever you make it for) warm! Here is a Michael Kors inspired simple scarf pattern. 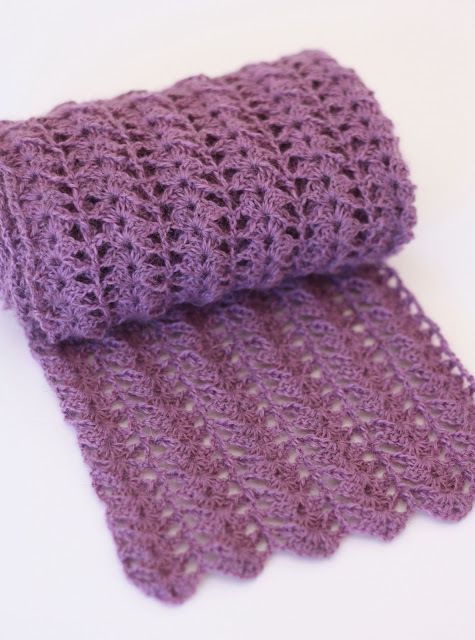 This lovely and elegant scarf uses the lovely griddle stitch which is made using a series of single crochet and double crochet stitches. Perfect for beginners, your friends asking if you’ll make one for them too. Toss on this modern crochet triangle scarf to head out to the desert, the mountains…or just the grocery store. The actual construction of this pattern is quite simple. You just increase for a bunch of rows and then you decrease for a bunch of rows. There are a couple of tricks to help make crocheting this infinity scarf pattern easier to crochet. One: Use a larger hook than the yarn recommends and Two: use stitches that require the hook to be inserted in a chain space (instead of the top two loops). This is so easy to work up, you will be able to make it in an afternoon. This is great for gift giving! Wrap up the coziest scarves for your friends and family this holiday season. 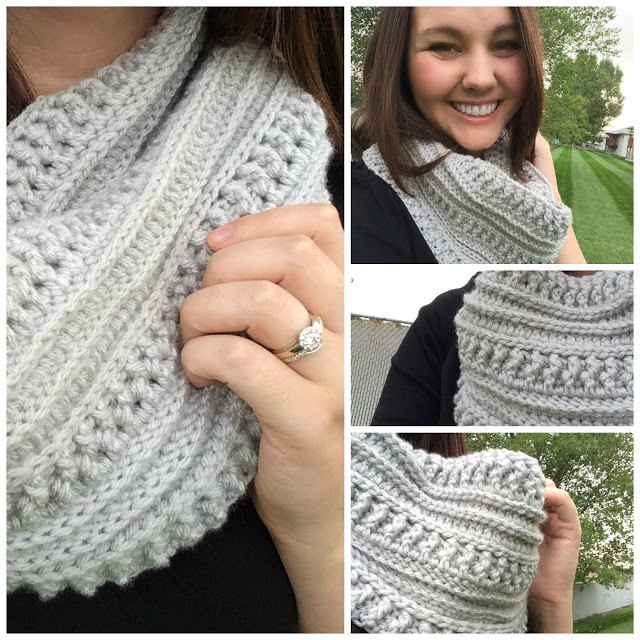 Texture reigns supreme in this exquisite crochet winter scarf pattern! Puff stitches add the majority of the bulk and texture with delicate chains adding geometric interest to the scarf. Delicate scallops, picots, and tassels finish out this designer piece–it was born for a night out on the town! Whether you’re caroling, Christmas present shopping, or enjoying dinner with friends, this unique scarf is sure to catch the eyes of all who see it! This buffalo plaid scarf is a classic look for fall, winter or the holidays! Perfect for both men and women, this simple pattern uses the plaid technique for changing colors and achieves the look of buffalo plaid. 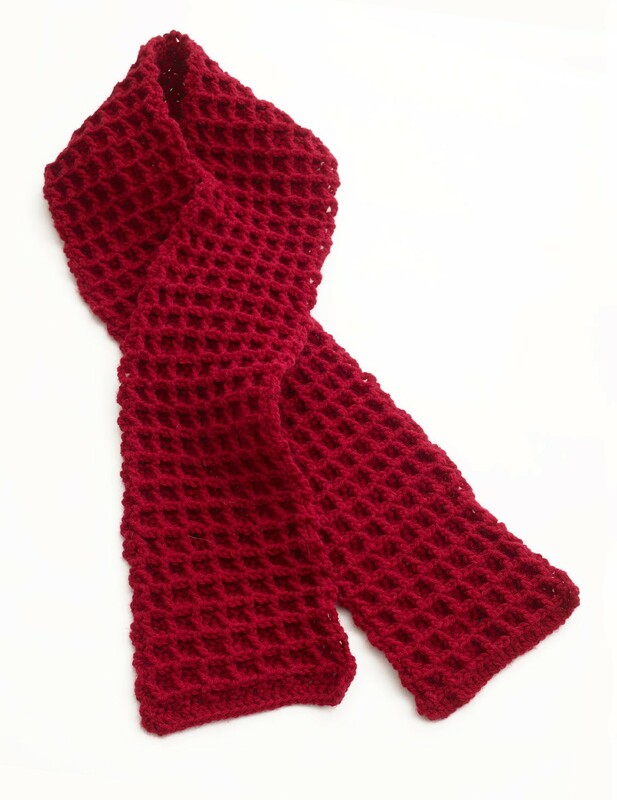 Enjoy making this fun and timeless scarf with this free crochet pattern. 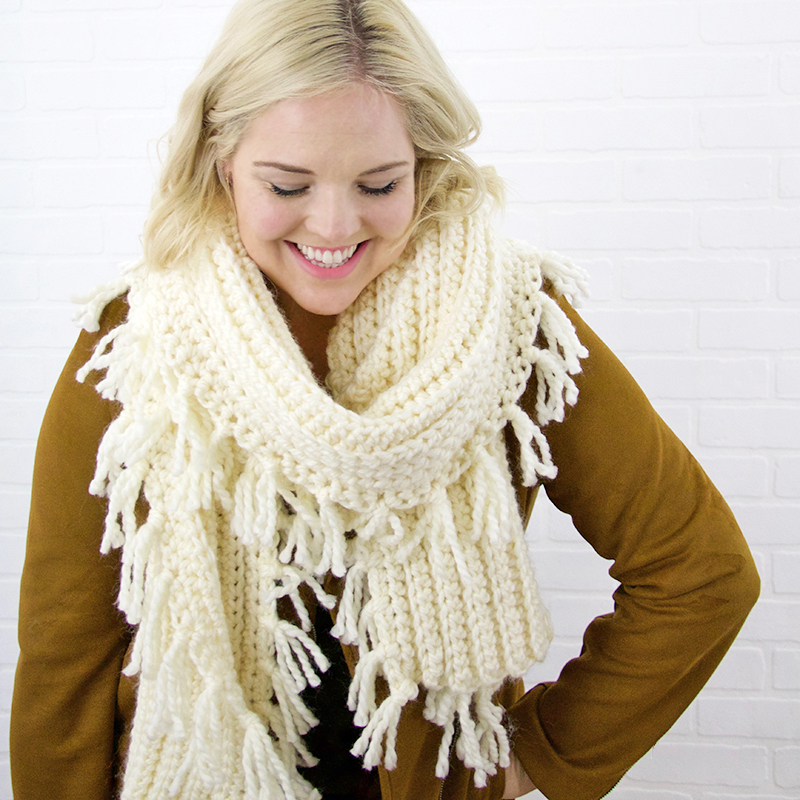 This scarf is so classic, it will be one of your easy go-to projects. 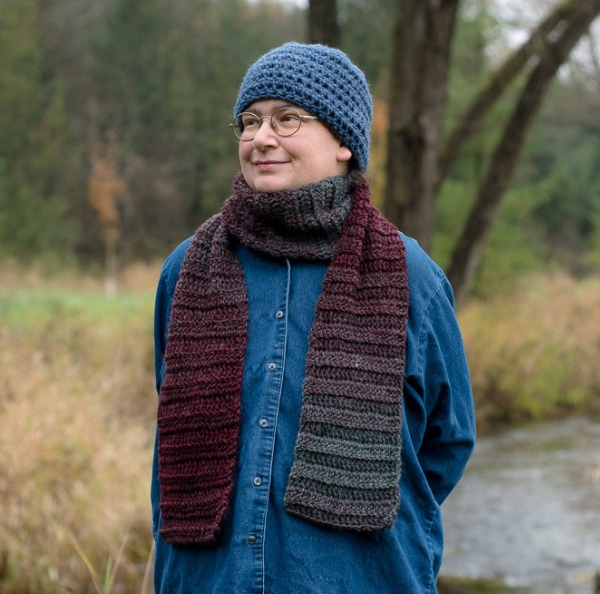 The free scarf pattern has been named the Maureen Scarf after the designer’s mom who is a fantastic crocheter and lover of yarn. The pattern is very easy and repetitive, perfect for crocheting on the go or in front of the TV. This pattern is made in both US crochet terms and UK crochet terms. 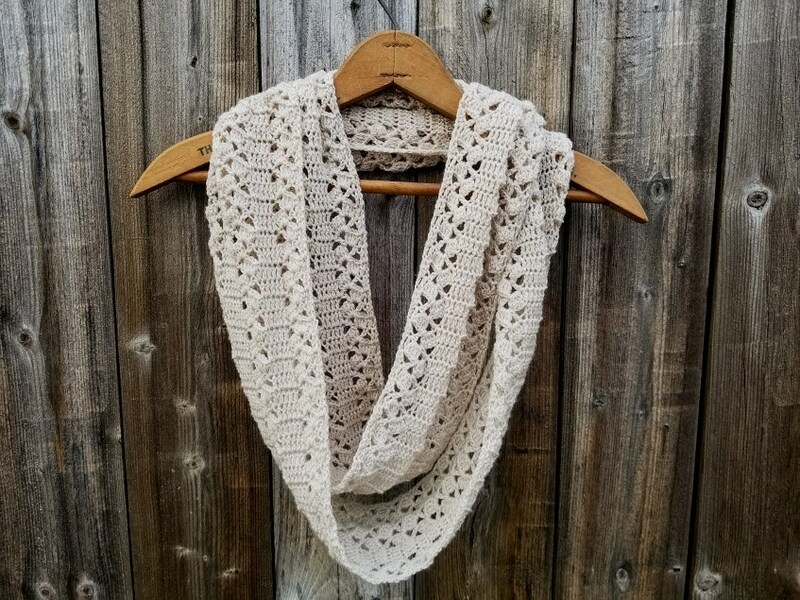 It’s a very easy crochet pattern: the scarf itself is made with double crochet stitches and the white diamond shaped overlay is made with slip stitches. This easy yet unique scarf, but with a special twist to make it more unique and chic. I used the surface slip stitch technique with white yarn on the vibrant colors to create a beautiful effect. This unique scarf is the perfect accessory to any outfit. Made with the square textured waffle stitch, it has a graphic look that makes it a perfect scarf for men as well as women – just change up the yarn colors. This pattern is pretty simple and nice and mindless once you get the rhythm of it. It’ll become a go-to pattern when you need a simple crochet project that requires little thinking. This pattern makes a pretty decent mid-size scarf. Change up your yarn color and/or hook size to personalize it even more. If you are looking for a scarf that is part triangle, and part straight, then this crochet V-stitch scarf pattern is for you! This has the lightweight feel of a straight scarf, with the fancy front part like a triangle scarf – but without the bulk around the neck. This pattern also comes with a crochet video tutorial to make things even easier for visual learners. 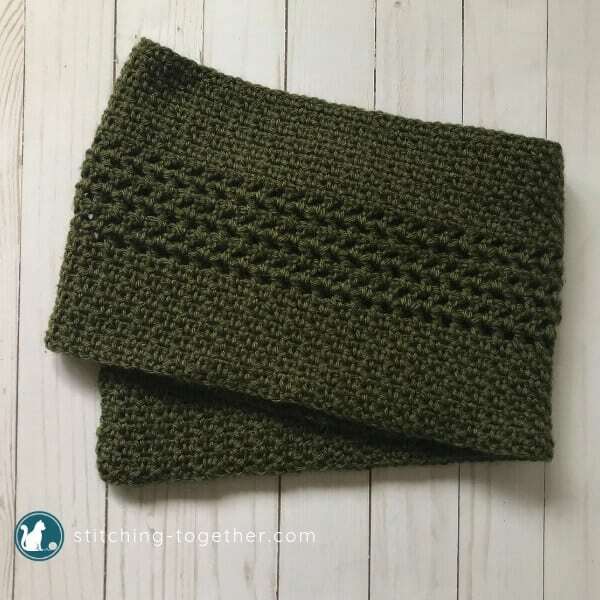 Sometimes an easy scarf pattern is just what you need, and this crochet moss stitch pattern fits the bill! It works up quickly with interesting detail in the center rows and it works for both men and women! The moss stitch, which also goes by MANY other names, is a simple single crochet, chain 1, single crochet repeat. 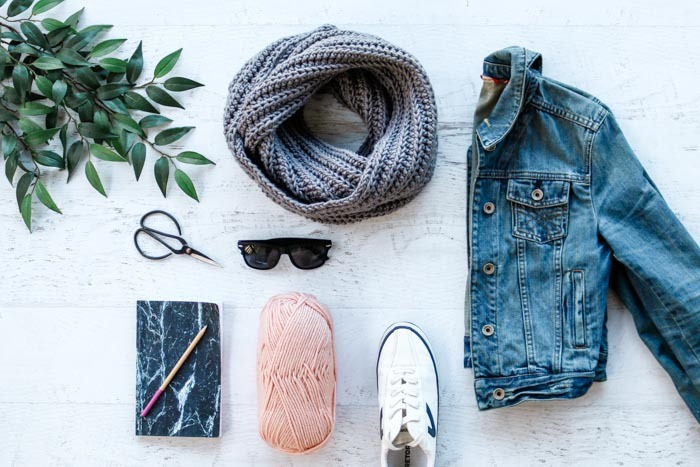 For cooler nights, a nice wrap or scarf can come in handy! 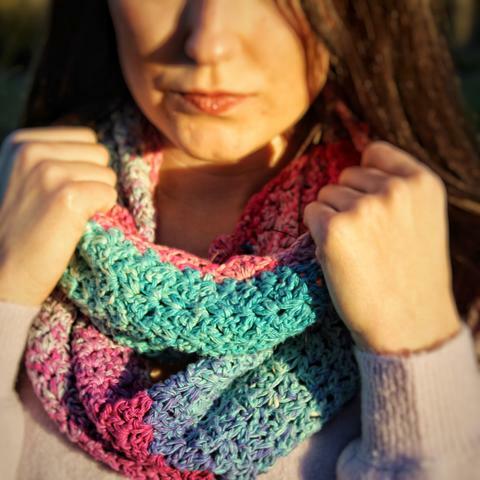 This crocheted scarf is fairly simple and the color changing yarn does all the work for you. Scarves also make nice summer crochet projects as they are small and easy to tote around whether you’re on a road trip or on a plane. 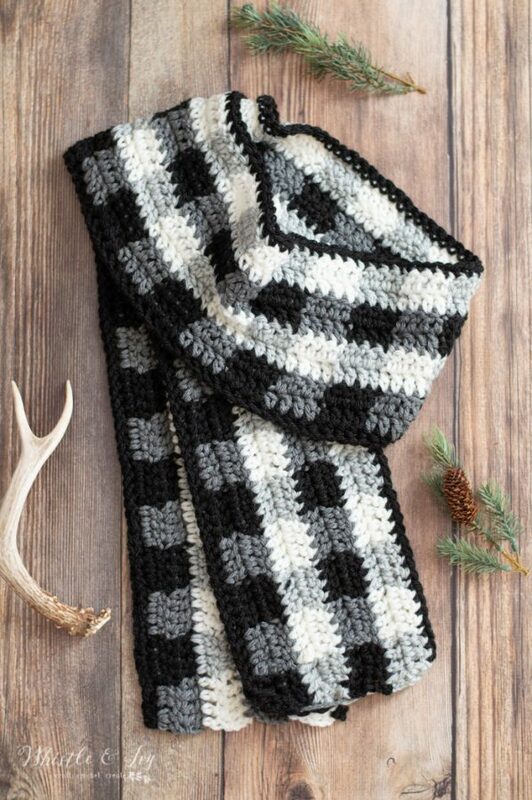 Crochet this timeless pattern with a fun checkered design. This is the perfect pattern for having fun with different color combinations. If you make it with more masculine colors, it would also make a lovely men’s scarf. 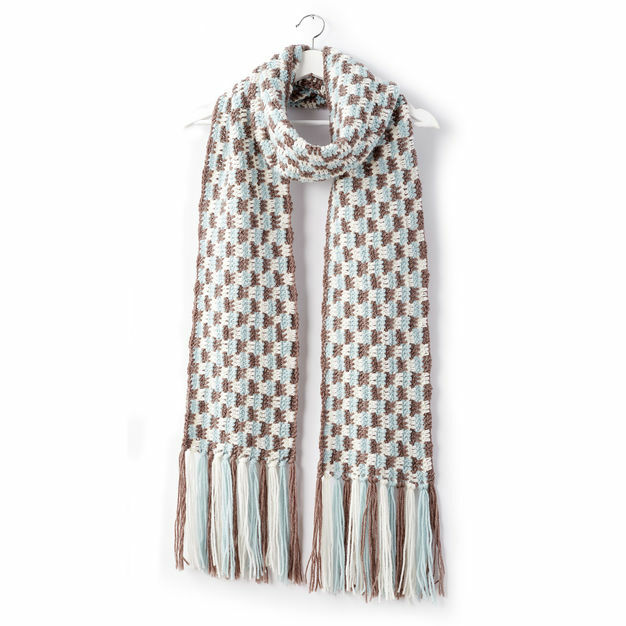 This scarf was designed to be romantic with a touch of rustic/country flair. With only needing to know how to single crochet, half double crochet, and double crochet, this definitely is a beginner project but still fun for crocheters with intermediate and advanced skills. It is also a one-row repeat, which makes this lace stitch pattern even better! Easy crochet pattern for beginners – this scarf is the perfect beginner scarf pattern if you’re looking for a fast 1 skein project that still has a unique look! 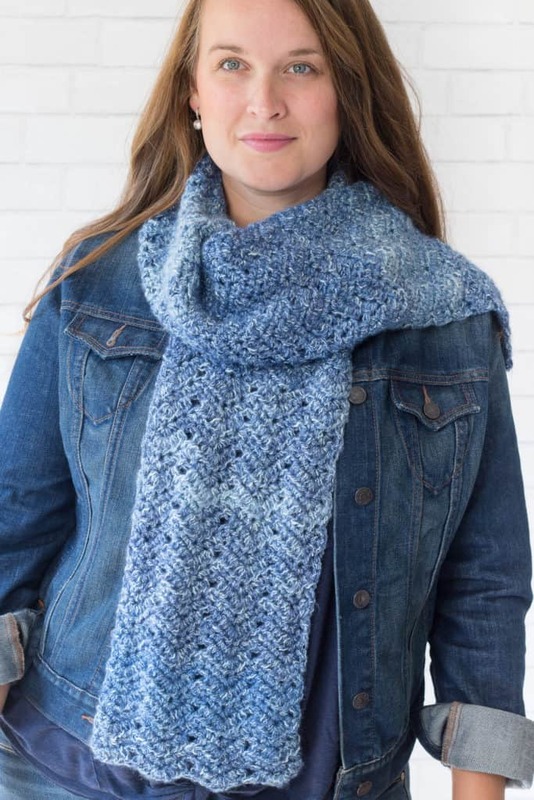 To give this scarf a unique look, you simply crochet into the back loop of the double crochet stitch instead of a normal double crochet stitch. 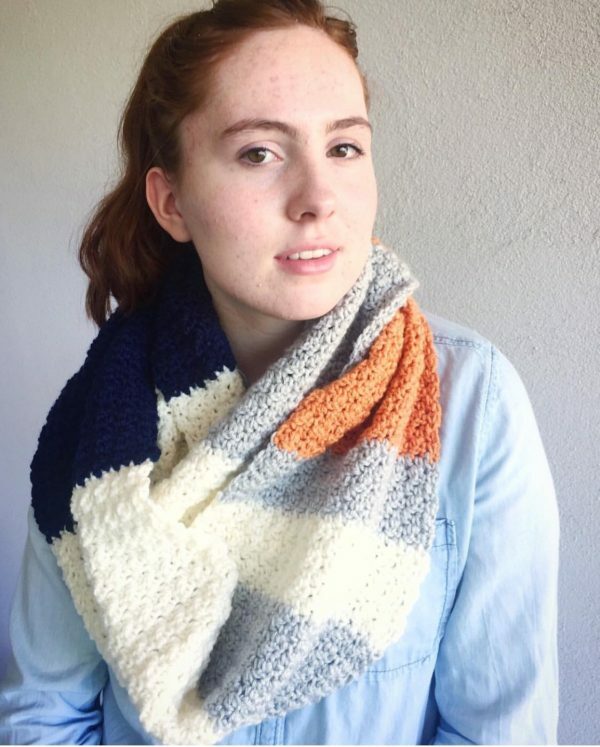 The Luna Chevron Scarf pattern is a quick pattern that uses a simple stitch repeat! Yay to easy patterns! To make this scarf easier to work up simply hold two strands together at the same time. When you do this it makes it a little bulkier crochet scarf which in turn makes it work up just a little bit faster. 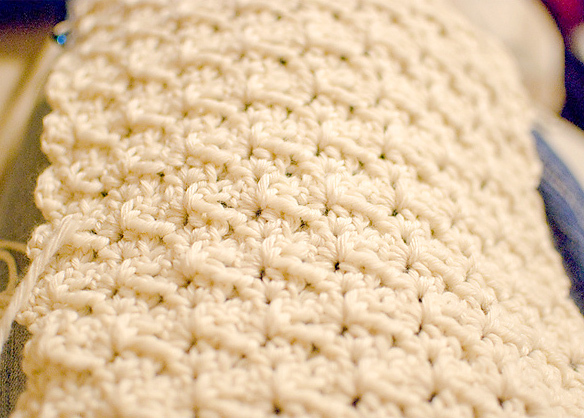 The simple texture of this project makes this a perfect beginner crochet project! Grab some fun colored yarn and you’ll whip up this easy pattern in no time flat. This easy pattern is made with basic crochet stitches and works up exceptionally fast. 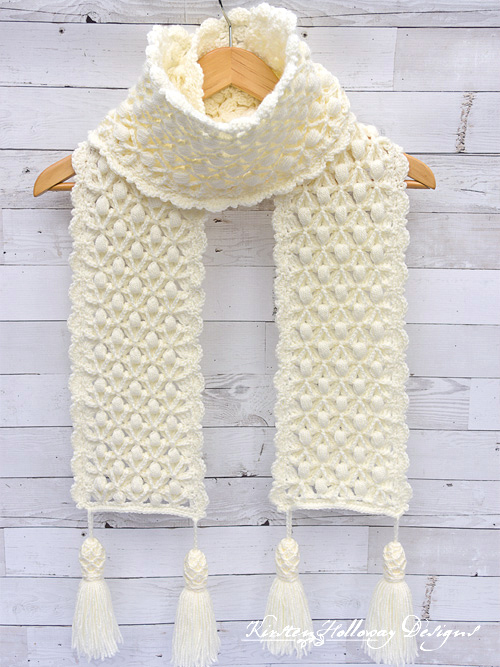 Made with chunky yarn this beautiful scarf will keep you warm and cozy on cool days. If you follow the trend in the crochet world, you probably know that the super scarves are really hot right now! Super Scarves are regular scarves, but wider and longer as the traditional ones. This Super Scarf has a nice drape and a wonderful texture made with a combination of front and backcrossed double crochet stitches. 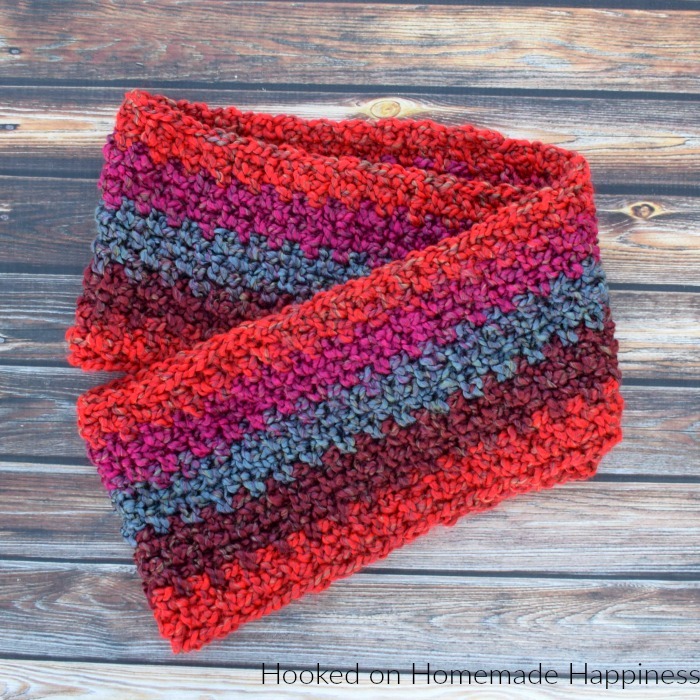 Worked lengthwise with soft and chunky yarn, this scarf will be a quick project that you will love crocheting and wearing! 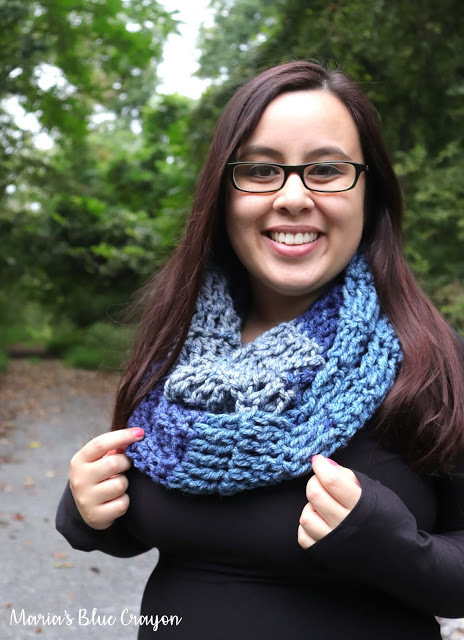 This infinity scarf is quick and easy to make. Although there are a lot of rows to crochet, the treble stitch plus the super bulky weight of the yarn makes it go be very fast! Infinity scarves are easy to put on for layering and easy to style. Just wrap it around your neck twice, and it just lays beautifully! Make it in fun colors to dress up a basic outfit or make it in a neutral color to match everything! Throughout the project, the yarn is held double. Pro Crochet Tip: it is easiest to complete double-stranded projects by winding the yarn together with a yarn winder from the beginning. Once you have your yarn, feed the ends of yarn of your two skeins of yarn together through the ball winder. You will now have a new ball of yarn where the yarn is held double throughout. Say goodbye to tangled yarn and dealing with two balls at once during your double-stranded projects! 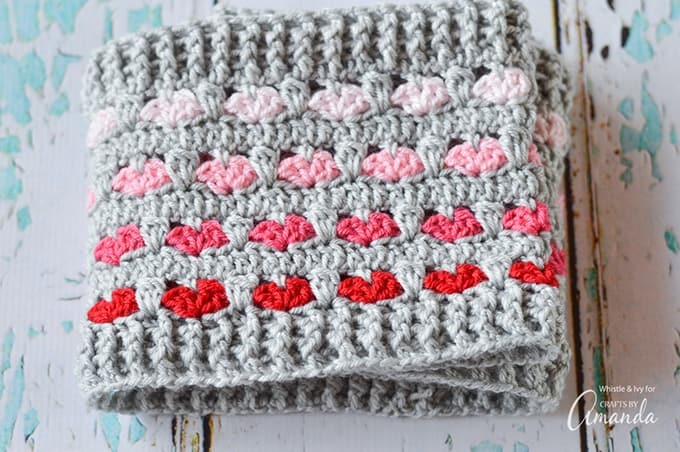 This scarf pattern is the perfect length to keep you cozy during the frigid months plus the little hearts are just so pretty! Don’t be intimidated by those adorable little hearts. They aren’t difficult to master and you will be surprised at how easy they are to make. There’s also a few photos to and a video tutorial for this infinity scarf crochet pattern if you need a visual. The pattern is a little unconventional in that, in order to achieve the knit look of the crochet in the 3rd loop rows without working in the round, the instructions call for you to finish off after each 3rd loop row and connect back up at the beginning of the row. It’s a little tedious, but well worth it for the final effect. And thankfully all those ends can easily be incorporated into the fringe, making for less weaving in! With a scarf pattern crochet a great gift for someone you love. This list has the best patterns for crochet scarves. 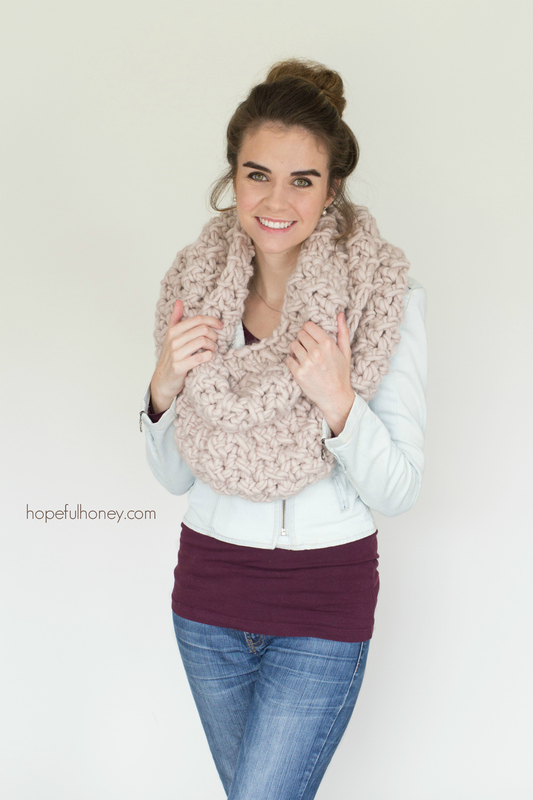 Pick between a crochet infinity scarf pattern or a cowl scarf. Whatever you want, this list has it. 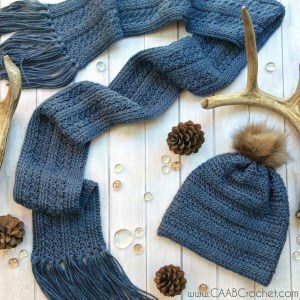 These patterns are beginner friendly and perfect for winter. Grab your hook and start creating. You can keep these patterns as your go to’s the next time you need to whip up a gift in a hurry. If you’re looking for a few more great patterns don’t forget to check out our patterns on Dabbles and Babbles including The Boyfriend Scarf, The Winter Wonderland Crochet Scarf, The Cross-Over Stitch Crochet Infinity Scarf, The Large Loop Infinity Scarf, and the popular Lily Cowl Crochet Pattern. The patterns are really great! I would like to make a number of them. Thank you…. Wow, what a beautiful collection of scarve. Now I have a to decide which one I will do first. I love so many of these scarves, thank you so much for the patterns, they ae great.